Liquid Love In Memory of Mandy aka Rainbo Selekta! 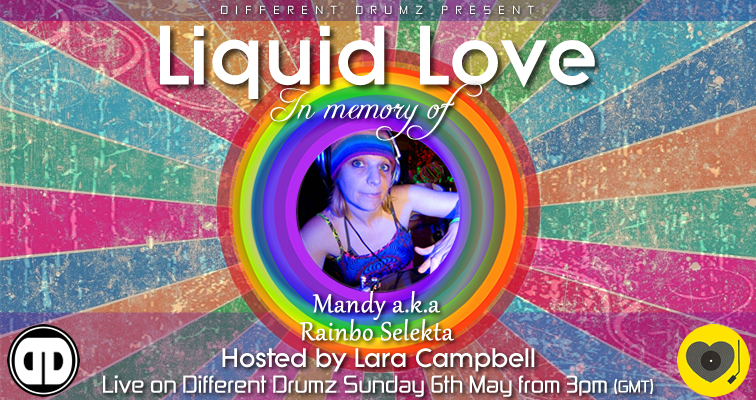 Sunday 6th May from 3PM (GMT) saw special guest Lara playing strictly the best of Mandy’s favourite liquid dnb tunes as a tribute to her memory and keeping her good vibes alive and to help keep a lost legend in our hearts! If you ever listened to Rainbo’s shows on Different Drumz or had the privilege of meeting her you would know she was one of the most beautiful and positive people on the planet sharing good vibes wherever she went and her shows were oozing with vibes everytime and this show is a tribute to her .. A massive thank you to everyone that tuned into the show and showed some love for a lost legend and of course to Lara for putting it all together and joining us on Different Drumz. If you missed the show or would just like to hear it again we now have it available to stream and download!